I live in the West 80s just off Central Park, so every Marathon-Day my neighborhood is transformed into the United Nations, a Tower of Babble, and “We Are the World,” all at once. When I walked along Columbus Avenue yesterday around 2 pm, I chatted with a Puerto Rican, a Swede, and a Brit within 5 minutes. The runners, of course, were easily recognizable by their superman/super-woman capes. Many of them were limping along, but happy to chat and thrilled to have finished the race. Many were waiting to connect with friends and loved ones. All of them were wearing bright bronze medals with the year 2010 proudly displayed. It was fun congratulating everyone I passed. 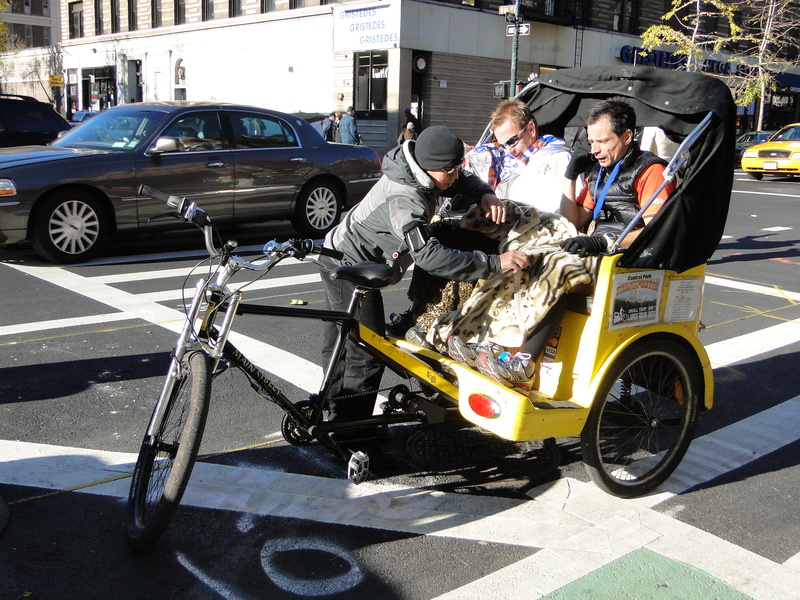 I was so happy to watch as a pedicab driver settled two of the runners into the seat and covered them with blankets. They were the heroes of the day and should be treated as such. Returning home about 5 pm, the scene looked totally different. On the corner of 86th and CPW, The Sweetie and I tried to help two Belgian women who could barely stand and didn’t seem certain of the name of their hotel. Finally a cop found them a cab–which were very scarce–and hopefully they got into a very hot bath. 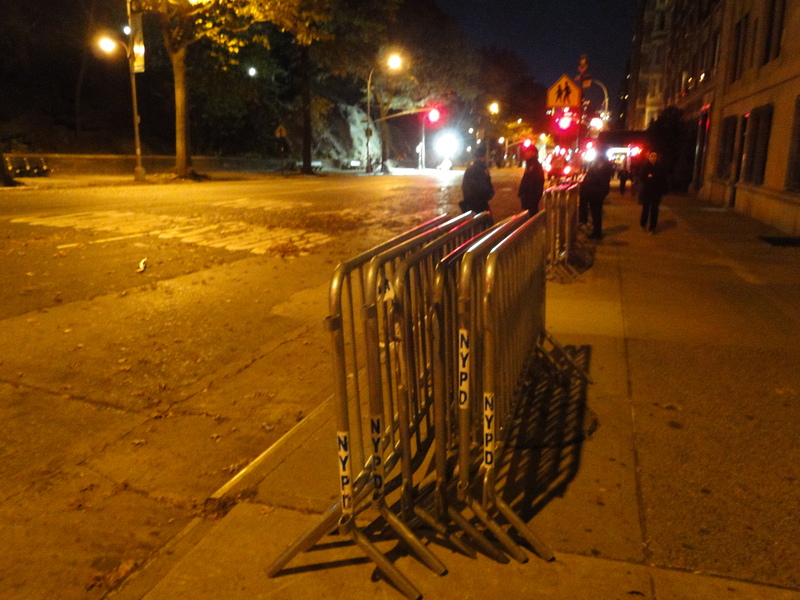 All of Central Park West below W. 86th was closed to traffic, awaiting the Sanitation trucks badly needed for clean-up: the garbage pails were overflowing and there was litter all along the street. There were gaggles of cops everywhere, but they reported that there were no medical emergencies during the day. I had a nice chat with the Sanitation truck driver about the alternative-side parking dance that happens twice a week in my ‘hood; he was poised at the end of my block, awaiting orders to get going. Next to the truck were 3 portosans. Everyone was in high spirits. Here’s what CPW looked like last night around 5. By 7 pm, it was as if the Marathon had never happened.